Chavez just declared he would "accept" his party's proposal for a referendum that would allow him to stand for the presidency after 2012. He said he would be president until 2021 if God gives him enough health for that. BBC on that here. Afterposten on that here (they seem to think Zulia is particularly prosperous because of its oil, even if the central government is the one distributing all the money). Venezuela has a presidential system, a very presidential system since 1999, when Chávez introduced his new constitution. Before 1999 presidents could be elected for five years and then they had to go away at least for five years. After 1999 the president can be reelected twice and the term lasts for 7 years. Chávez was elected as president of Venezuela when the oil price had been at an all-time low of $12 per barrel and the price started to climb from 2002. Now the price is dropping. November 1992: Chávez's military friends tried a bloodier coup and failed as well. All will be release beforehand by president Caldera later on. The question is now: how fast can the red-very-red National Electoral System organize the new referendum? Mind: the oil price I wrote here is the average per year. It is more interesting to look at the price per month. The oil price has been dropping from an all-time high in July 2008 (when the OPEC price was $131.22). Also remember: prices of today are about payments in a couple of months. (This happened a few weeks ago)Its Monday and a friend of mine -philosophy undergraduate- is preparing an art exhibit at campus. He's wearing a black shirt, which I find unusual and carries a sad look on his face. I'm wondering why he doesn't show any excitement: he has been talking about this exhibit for ages. But as I help him to finish the last details minutes before the opening ceremony, I think that my friend's bad mood its only ought to a certain nervousness. He was killed during the weekend and Abelardo (his son) was hurt. I went to his funeral yesterday..." It all comes quickly back to my mind. I never met personally Prof García but by the constant comment and stories from the friends I have from the Philosophy school, I know he taught political philosophy and was very appreciated among his students. Prof. García (according to my friend' story) was killed for committing the sin of trying to run away with his car from a thief. The thief apparently went mad about this not so nice act and discharged his gun against the car, causing the professor' death in the process; making him know - way too late - that you can't possible run away from the bullets since they are always faster than you. Its Monday and a friend of mine opens his long expected art exhibit at campus, and speaks to an audience like me - unaware of the latest events or that they probably heard the news and did not pay attention to the details because we hear stories like that one a lot. He dedicates his paintings to his professor as he tries to paint a half smile on his face. The routine applause of this kind of events gives him the sign that life must continue. I got the feeling that her voice was slowly breaking and that she would start crying any minute now but she didn’t. She just added “I’m afraid now” – And got off the table to went straight to her room. My sister’ face looked like a funeral. But my brother in law and I reacted in a different way. Although it is not politically correct to say this, I’m ought to admit that I felt angry with my mom for telling us that story; because there’s nothing we can do about it so, What’s the point on spending a valuable time of our lives worrying and fearing disgraces we cannot stop or change?. Can we protect us somehow? No, we don’t have the resources to install a wall and/or some security system at our place and there’s no guarantee of protection on possessing a gun, besides my family values (thankfully) would never allow them to do that. Can we ask someone else for protection? Also no. We trust the police even less than the thieves and assassins out there and if you continue reading this blog carefully you will notice that the government has not moved one single finger to reduce the delinquency but quite the opposite: has allowed it to increase. And it doesn’t seem that another citizen request for security will bring anything besides an equally worse political retaliation. Can we put our possessions somewhere else in a way that we don’t look as “robbery or kidnap material”? I have refused to buy an IPOD and prefer to stay with a cheap Mp3 and a pair of old headphones fixed with scotch tape, I never wear any jewelry except only a pair of fantasy earrings and avoid, specially if I’m using public transportation, to walk around the city wearing good clothes. With those rituals, my hope is to look as a “bad business” for the delinquents. But my light skin, my sort of Spanish look- like face and the bus stop where I get down shows clearly that I don’t belong to a poor neighborhood and there’s nothing I can do to hide that. Plus; there’s a possession, the most valuable of all that you can’t perform a lot of tricks to protect: its called life and it seems to be stolen to equally rich, poor people, middle class, people who seem to have a lot of money but don’t even have a penny, to simply everybody in Venezuela. 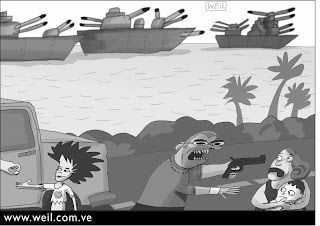 I think the delinquency is the most democratic thing Venezuela has at the moment. So the answer is also, no. Is there’s anything we can do to avoid suffering the terrible ending that lawyer my mom told us today had? To experience the million of similar stories, one worse than the other that we hear every single damn day? No. I don’t want to move on with this imaginary story, sometimes I don’t know if I should just call him and say “hey! lets not see each other again because our dates could be interrupted with the insecurity ghost… lets continue with out relationship over the phone and “live” our lives inside our rooms, inside our houses, waiting for the thieves who can also come inside our rooms, inside our houses, took away our lives and make it look like a suicide…” I just don’t see the point of feeling fear if there’s nothing you can do to change the circumstances that created that fear. That’s why I felt angry with my mom, because after another happy lunch, she filled our nerves with fear, tension, sadness, frustration, guilt, sorrow and a long list of etc. I know you will answer this story with things such as the free speech and the need for information, you will think about how is it possible that I’m promoting simply not to be informed about the events that are ought to be in front page of every single paper because of their cruelty. You will ask me “What about this lawyer? And his family? Don’t they deserved to make the world know what happened?”. Dear reader, I’m completely agree with you. I’m a person who has repeated that couple of words (free speech) and has being mad to those who are irresponsible enough to simply not wanting to know what’s going on out there. I’m one of those who yells at others things like “as long as it doesn’t touch you, you are not going to care”. It’s a paradox really. I know I need to know, I know I must know but yet I’m angry at mom because she made me know. And until that second she opened her mouth I was happy, I was so happy you couldn’t believe it. I got a new and lovely part time job that allows me to keep working on my thesis.. I saw the news on CNN to find out the time the debate between Obama and Mc Cain was suppose to start and made it into the perfect excuse for asking my boyfriend to come over tonight. I was planning to spend the afternoon between a thesis chapter I must finish and my piano, right after lunch; then a long bath, then choosing the best clothes (nothing that looked too classy, because after all he’s only going to come over to watch a televised debate; but something that made me look at least decent), then a little make up and then to act casual until I saw his car stopping at my place. Then a hug, a kiss, a “how was your day at work?” I was so stupidly happy living my day and thinking about how great was going to be the rest of it. Then came lunch, my mom told us a story about a lawyer killed inside his place for not other excuse than stealing lame less things. Then my sister’ funeral face. And all my happiness switched with an intense fear mixed with the certainty that I can’t do anything about it. My picture of a night laying in the couch watching a debate was changed for strange scenes of thieves and guns and who knows what else making me lose not only my money (I wish this were only about stealing money and that’s it) but the ones I love the most. I felt like crying. I felt like writing here. I forgot about the piano or the thesis. And I just made a speech against free speech because life has remind me to build a commitment with the life itself sacrificing the commitment I had with ulterior things, such as the right to be informed. Whenever I write about fear I think of this prelude of the first Cello Suite by Bach. Here's a lovely interpretation I found in youtube. Of course, such a political phenomenon is never complete and bears the seeds of its own demise as it takes shape, but I think that this election marks the high water of Chavez strategy to make two Venezuelas so as to have one chunk large enough to rule over the other until it either submits or is politically obliterated. Whichever comes first. If the red expanse seems rather daunting, it is important to note that it corresponds mostly to relatively empty areas, the Llanos, Monagas and Southern Anzoategui, Bolivar and Delta Amacuro and even up to a point Falcon. 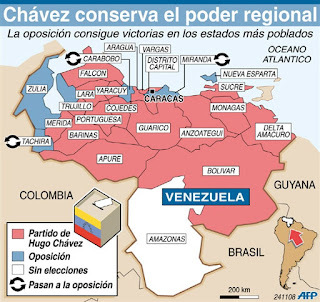 Of the densely industrial settled areas chavismo only gets Aragua, by a not very large margin, and Lara by a whopping margin but with a Governor elect who is highly suspected inside PSUV circles. Indeed, part of his whopping victory is due to opposition voting for him. The densely settled agricultural areas are sort of evenly split between the two camps, Tachira on one side and Merida and Trujillo on the other. Yaracuy and Sucre are sort of hybrid areas between densely and not so densely settled areas. I will get into the details in future posts but it is good to start by addressing squarely the difference between the more economically advanced areas of Venezuela (Zulia is both agricultural and industrial power house, by the way) and the less advanced ones. The main explanation comes form the ten years of Chavez rule. Policies of land expropriation, of not really promoting actively independent production even at the small level, of economic insecurity, of crime and other calamities such as impassable roads have basically stunted any real growth in the large agricultural areas. And of course also stunting the growth of the cities of these areas who could have developed a vibrant agribusiness system, but did not. Not to mention the white elephants of corruption such as the vaunted gigantic sugar mill of CAEEZ in Barinas. In ten years these areas have become increasingly dependent of government subsidies, be they public administration jobs, misiones handouts or even agricultural subsidies. Some states, such as Vargas and Sucre have become so dependent on governmental handouts that chavismo got an unexpected victory in one and another one with an unexpected margin. Without such extremes this situation is also reproduced in Yaracuy, Cojedes, Guarico, Apure, Falcon, Monagas, Trujillo and to a lesser extent in Merida, Bolivar and Anzoategui. Aragua and Lara do have a leftist tradition which brings a supplemental element to this phenomenon. To this you add the brutal campaign of Chavez, with threats, blackmail and all sorts of undue pressure. Now, you can do a simple math here. The public rolls, depending on how you calculate them, go from 2 to 3 million folks. Let's say for the sake of the argument that a third of them come from the "ancien regime" and still vote against Chavez. But what about the other 2/3? That is, at the very least one million of public servants are genuinely worried to lose their job if chavismo loses a given town or state. And how many people depend on that governmental pay check? How many votes for Chavez does that translate into? Now, certainly this is not enough to explain Chavez victory. There is also the social grudges, the hopes, the dreams, the revenge, ideology, whatever, but my point is that in these states where chavismo won yesterday the margin of victory depended significantly on the threats directly mentioned by Chavez when he menaced to cut resources from states that do not vote for him. The campaign was effective: in mid September even this blogger was seeing a trend towards 10 states for the opposition. By mid November I had dropped again that estimate to 5-7, forgetting completely my "best case scenario". But if I think that Chavez strategy was successful in rallying his troops, believers or not, I also think it went as far as it could go. In fact one or two weeks more of campaign and under such an assault the opposition would have united better and carried places it lost last Sunday, namely Bolivar and maybe Barinas. Getting Tachira or Carabobo for chavismo would not have really compensated for the symbolic loss of Barinas or the real loss of Bolivar. There is law in negative campaigning, which is what Chavez did, it only works if you also bring something positive from your side. By the end of the campaign the "me or chaos" of Chavez was getting thin on this respect. I will go later into details to illustrate more or less directly some of the things I wrote above, but right now I want to state something: last Sunday chavismo got its last fear victory. The price it will pay for this victory, if we only look at number of states and votes obtained, is that the opposition survived a brutal onslaught, regrouped in stronger and more decided group and proved it can start offering something, and win on it. This is not anymore the defeated opposition of October 2004, not even the barely awakening opposition of 2006. This is now a real opposition, still weak, fragile, but there, present and growing. And it can thank Chavez from his foolish decision to turn the campaign again on a plebiscite on him to in the end pick up only a couple extra states. Ugly greed, no? That is why the victory of Chavez has a taste of defeat because as Teodoro Petkoff so simply stated, it was a "political" victory for the opposition, and it is perceived by all, even chavistas, as such. I cannot tell you how subdued was chavismo "celebration" in San Felipe compared to the one 4 years ago. And yet Julio Leon Heredia got a much, much better result than Gimenez in 2004. By losing 5 states, including the three bigger ones, by losing Caracas, the political and cultural center of Venezuela, by winning in popular Sucre district and gaining back Maracaibo the opposition can hide very well its other less good results while chavismo is at loss to explain how come in Caucaguita it ONLY got 64,6% of the vote when it should have gotten much more. In 2004 it got 71,3%, in 2006 72,4%, but in 2007 only 59,6%. In 2008 it did not recover these voters lost in 2007. It is worth putting up in a graph the results for Caucaguita since 2004 and think about their meaning. Why look at Caucaguita? For people old enough reading this blog you will remember the famous political add of 1978 Luis Herrera when he went to Caucaguita, then a very recent slum in Eastern Caracas on the Guarenas road. There he talked to Aleida Josefina and empathized with her. That spot was one of the big hits of that campaign where Herrera defeated the AD machinery. Of course, once in office he forgot about Caucaguita and I believe that Chavez went there in 1998. I do not know whether he ever went back, but Caucaguita in spite of awful public housing built by Luis Herrera (?) is hardly better off than in 1978. Chavez did mention last Monday Caucaguita as one of the popular districts he won and I went to look at the date graphed above. You can see if for yourself: Chavez HAS NOT recovered his presidential vote of 2006, and the opposition vote is not only more steady than his vote but it shows a trend to grow. Sure, the opposition will probably not win in Caucaguita for another 20 years, if ever, but that the chavista bases are weakening is clearly seen in those results. I am willing to bet that similar graphs can be drawn from all of the popular Sucre/Petare districts and that maybe in all of them the opposition vote has eroded the chavista vote. Yes, Chavez won in every popular district but he failed to recover his shine and the the ceiling has been reached in 2006, likely never to be reached again. Chavez can scream all what he wants to foreign journalists or even to his followers, they all know because they can either figure out data like what I show or because simply they live at Cuacaguita and know better. Here you can see the new Venezuelan political map (counting only the governors of each state, not the mayors, I will try to work on a map based on those results as soon as I got them). It is quite obvious that Chavez' party won and won big at most of the states, leaving us only a very few blue areas. But the ones who are busy celebrating that our country is still totally revolutionary, must look at those tiny blue areas: the states with most population, most industries and therefore with more strategic importance that the other except for the case of Bolívar or Anzoátegui that still belong to them; are now in opposition hands. They are bubbles, crowded bubbles, trapped and alone in a world that still belong to the revolution, surrounded by revolutionary states, exposed to the constant threats of the government but still offering not only resistance but maybe proper alternative political projects to the country. Things doesn't look as good as I wanted, and it makes me sad to see Venezuelans of those red states voting like sheeps for the Commander and Chief desires. It makes me sad to see that a huge part of Venezuela, probably the most part, think that the Revolution is actually good for us. I don't care if people like the Revolution or not, my point is that the forces are not even close of being balanced and the Revolution has way too much power in part because a lot of people wanted that way, and still do. But things can get better, with time. The mayors and governors who are going to be at the offices that once belong to the Revolution have a lot of work to do, in most parts the Revolution has proof to be nothing but unneficient in its way to rule. In Caracas, from having only three mayors out of six, we have five now so I trust this brings some changes to my city that has become dangerous, dirty and depressive under the Revolution command. Lets just wait and see if the life inside one of those crowded bubbles proof to make some difference. We got 5 states out of 22. That is less than we wanted but far more than what Chavismo had said we would get (1). I should have followed my gut feeling and just had dropped the Llanero states I had - with a lot of doubt, as I wrote - put on the side of the opposition: Barinas, Guárico and Cojedes. I will go back to what happened there later. The cool thing is we got Miranda back and the Alcaldía Mayor. The opposition is now in charge of the state governments of a little bit over 40% of the population. I want you to listen to this from The Guardian's excellent journalist Rory Carroll. He talks specially about Petare, Venezuela's biggest slum, now anti-Chavez. Now on the background, very low, at the end, you can listen to a lady who still supports Chavez to the end. It is a poor woman from that slum as well and what you hear is "three mattresses, a washing machine". Those are the things she got from the government to secure her vote. I can understand her in her conditions even though I know what she loses is more: to have a country where tolerance and transparency, sustainable development and better education are the norm. I have looked election after election that finger and can't help but thinking on how akward this practice of marking us like cows is. But the purple mark has become a certain symbol of prestige, and those who don't have that finger painted tomorrow will recieve killer looks from others. Same as the ring proof you are engaged or married, this purple fingers proof I'm a citizen; or at least I try to. Some students groups of my university make out of this finger issue, a slogan for calling people to vote. "Mójate el chiquito" - "Wet the little one" - said the slogan in that fun and irrevent and obviously second sense way. Well, in the meantime I'm waiting for the results and trying to not listen to many rumors circulating, they say that someone won this and someone won that... at the end mostly are only rumors. I will update this blog as soon as I got official results. But that's probably not going to happen till very late at night... the Electoral Center never let us sleep on days like this. UPDATE!! The CNE finally (at 12:00 am) gave the first result. We are still waiting for the results of three states. The opposition won at only three states so far: Zulia, Miranda (mine) and Nueva Esparta. If you do the math that means that at least 16 states remain in the hands of Chavez' party. I don't know what to do with those results, if to cry, if not, if to trust them or not. I think I need to sleep now, knowing that even counting that seems like I still live in a Chavista (pro-Chavez) country, at least I don't live in a Chavista state, that's for sure. But the winner of Miranda is Capriles Radonsky, not exactly the guy I wanted even if he's from the opposition. The one I wanted was Mendoza and his political rights for running were denied by the general attorney. So thats how our "democracy" works. I just need to sleep right now and will come tomorrow with more clean thoughts.